“Finally!” I thought to myself while photographing the opera house in Sydney. Yes, I have never been to Sydney before and this is my very first visit there. 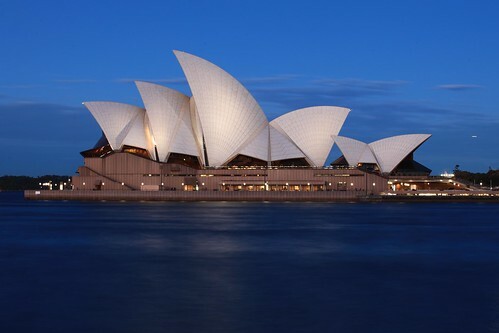 I knew myself that I must have at least seen the Sydney opera house once if I’m there, it is an icon of the city! I carried my lens in my backpack and while nearing the bay just across the water, I took out my 70-200mm f2.8 L for few test shots! As I got nearer, I realized that 50mm f1.2 L would be good too and it framed nicely into my 5d II! It was almost 1730hr when I started taking photos of the opera house, I loved the sky as it gets darker as shown in the image below. And I have also waited patiently for the spotlights to be turned on and give a nice light cast on the opera house. I mounted my camera on my tripod and took long exposure for this image to even out the water and to get nice lights around. Thanks! I did enjoy myself despite the cold weather! I was really lucky to have such nice blue sky as my background! Yes! You may! Hahaha! Feel free to follow my blog too! Amazing :). Never been to Australia…hope i go soon lol. You will and by then, I will be viewing your photos from Australia! Such a magnificent site and so beautifully photographed. Thank you very much and you are very welcome to follow my blog! Cheers! Best photo I have ever seen of it–and my parents go fairly frequently and always bring back postcards and such. I’ve never been yet but plan to someday. My auntie lives in Melbourne, so it would be easy to spend a few days in Sydney on our way out to see her. My parents have been about 14 times so far–they love Oz! Yes! Oz is a very nice place to go! Yea… You will love it! Beautiful shot! Never been to Australia would I would like to go some day. You’re fortunate to be able to travel so much! Enjoy seeing these places through your lens! You are welcome! I love traveling and photography! Thanks so much for dropping by! Thank you very much nitzus! never loved the opera house, but the photo shows something it might have in real life. I have no intention of visiting Australia, there are so many other places to visit with my limited money and unlimited imagination. Thanks for stopping by Keeping up with Carol! Fantastic pictures! One day, one day I will visit and perhaps even stay! You should and you will enjoy yourself there~! do you remember how long your exposure was for this shot? This was taken with 20seconds exposure. wow only 20seconds that is pretty good! This is beautiful mate. As a Sydney sider I take for granted just hot photogenic the sweeping sails of our iconic Opera House are. You do them great justice with this shot! That’s a great shot. You are blessed to be able to visit so many awesome sites! Thank you! Yea! I am so fortunate to be able to travel so extensively! Cheers!! That’s a really classic icon. I really liked this photo. Thank you! I’m glad that you like it! Simply beautiful! Love the lighting! Thanks a lot! I was lucky to be there during the right time! Lovely shot! I actually really love the blueness that surrounds it, it seems different and unexpected from other photographs of the opera house. Really well done! A gorgeous capture of the Sydney’s famous opera house, a wonderful shot you captured of it too. So glad I found your blog Alex, your photos are incredible… looking forward to following your journey around the World… You may definitely come to Ireland some day wih your camera!! That is what I have been planning but not so soon I guess, I have always wanted to go to Ireland one of these days but with my limited resources(money), I guess I have to wait and see. Yea! Cheers and thanks for visiting! You bet you will! Thanks for your compliment! Cheers!